Toyota Canada President Larry Hutchinson says that sales are up because of good product and low interest rates. Larry Hutchinson, who this year became the first Canadian president and CEO of Toyota Canada Inc., said his father told him people would always need three things; food, transportation and housing. Hutchinson, who grew up on a farm near Chesley, Ont., picked transportation. 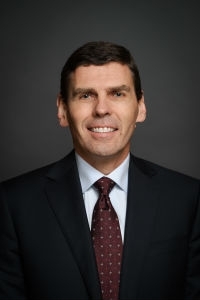 After a stint at General Motors Canada under a co-op program while he earned a business degree from Wilfrid Laurier University, he accepted a job offer at Toyota in 1986. He’s worked in all facets of the company, from product planning to sales, distribution and marketing. Hutchinson, 52, shared his views on the outlook for the Canadian market in an interview with Automotive News Canada. Q: Canadian car and light truck sales reached about 1.9 million in 2015, a third-straight record. Some analysts are predicting a flat market this year. What’s Toyota’s take? “The product that’s available is fantastic, not just from us but from the industry ... interest rates are great. We don’t see them changing for the next couple of years. We think fundamentally they’re going to be very, very low for the foreseeable future. “It’s true [cars] are lasting longer but there’s a lot of old cars on the road . . . so there’s replacement demand, plus we’re a growing country. What’s behind the planned shift of Corolla production to Mexico in favour of building RAV4 at Cambridge and Woodstock? RAV4 is Toyota Canada’s top seller, replacing Corolla. How challenging is it to sell into the softer compact segment? What’s Toyota’s view of Canadian auto production in a globalized industry and free-trade deals such as the Trans-Pacific Partnership?